This was going to be a good phone call. The MLB Network documentary, “Bench,” is making its debut at 8 p.m. ET Wednesday, and I wanted to talk with the Hall of Fame catcher and Cincinnati Reds legend about this film, which chronicled his amazing career — on and off the field — but also focused on his life now. Bench, who turned 71 in December, is a single dad with two sons, Justin (12) and Josh (9). SN: What’s on tap for you and the boys tonight? BENCH: Tonight, it’s chicken piccata and meatballs. Josh will get his normal chicken tenders. I’ve actually got corned beef in the cooker right now. It’s going to be just a nice comfortable evening again. And I’ll get them to bed at 8:30, and then I’ll start again tomorrow at 5:50. I’ll wake up, and then they’re up at 6:25. That’s our lives. I love it. SN: That’s awesome. So, I’m a first-time dad, and my baby girl just turned 5 months old a couple of days ago. What dad advice do you have for me? BENCH: Get up and change the diaper. I don’t care how many times you have to do it, every three hours or every five hours, and when you have to feed her, feed her. Don’t worry about that. You’re going to be so happy when you’re in that rocker feeding her and rocking her back to sleep. And even when you’re not getting any sleep, it’s worth it. Every little bit is worth it. Don’t complain about anything, just ask what else can I do for her? How else can I be of assistance? Let me take her for a walk. Let me do whatever I need to do. There will be time when they don’t want to be held. You want to hold them but they can’t do it, and then they start to walk and run and then the cuddling and the holding kind of go away. You’ll get a hug every now and again. Of course, that’s our morning ritual. We get a hug. That’s our New Year’s resolution. I get a hug every morning. I kiss them good night every night. Just think how lucky you are. I know you work hard, but your wife works harder. So whenever you get a chance, say, “I’ll watch the baby, you go out with a girlfriend or just have a little bit of time for yourself.” It’s tough. I mean, it’s tough. Every now and then they just need a little understanding, or a glass of wine. Maybe that helps. BENCH: Al Michaels just called me. Al was a big part of the documentary, and he said, “I just saw it and had to call you and tell you how great it was.” I can’t even tell you how great I thought it was. I thought Tony (Ferraiolo), the producer, did an unbelievable job, he really did. It showed my career, which I’m very proud of. It showed the boys, it showed our lifestyle. When you have Toby Keith and Bobby Knight — Bobby was fantastic, Pete (Rose) was fantastic, Tony (Perez) was fantastic, Brent Musburger was on it. I couldn’t imagine this could really be put on film. It’s just unbelievable, for me. I had tears in my eyes when I was watching. And a lot of it was, too, winning the World Series. People always ask, ‘What was your best moment in baseball?” And I always say, the day I walked into the clubhouse after we won Game 7. There are a lot of individual awards, but to walk in there and see Merv Rettenmund and Terry Crowley and Bill Plummer and the equipment men and the trainers and coaches … we were all world champions. Then there were times I’d hit a few home runs and stuff and I’d be in the dugout, and I’m seeing Dann Bilardello and Champ Summers and Rick Auerbach on the documentary. And I was seeing Milt Wilcox and all these guys I played with and shared so much with. It was just really meaningful to me. To have the boys and our back-and-forth, the one-on-ones and all the stuff that goes along with that in my everyday life, I would say it’s perfect. Just perfect. BENCH: They went back to my hometown of Binger, Oklahoma. They had a few of my classmates, Ronnie (Crain) played baseball with me and David (Gunter) was a year behind. They were on the baseball team. And Karen (Parker) and Sharon (Kniffin) talked about Binger High School and about how I’m competitive. These girls, my classmates, they’re still there in town. They look after the town, I mean they really do. They took this building that was empty, this office space, and went in and painted it all, then they hired a couple of cooks to come in and these guys, they cook every day. People in Binger can come in and eat for four dollars and fifty cents and they can socialize. And if you’re from out of town, it’s $5.50, if you’re thinking about going down there and getting a good meal. The museum is there. 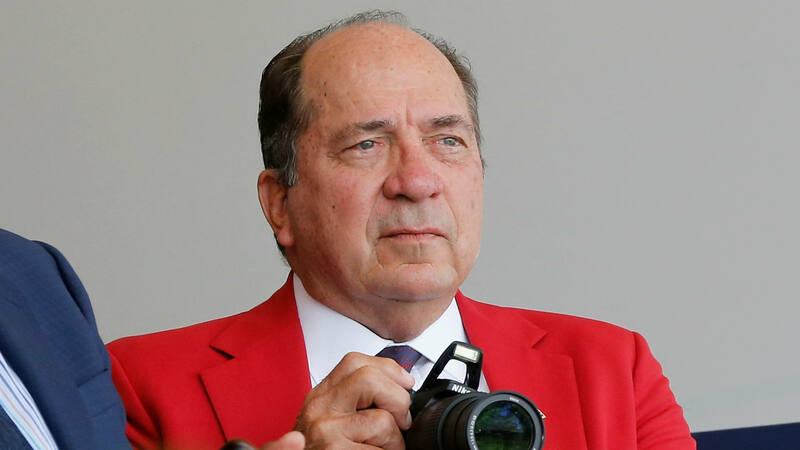 Just to see them talk about my hometown and how the baseball field is Johnny Bench Field. Did it surprise me? There’s always trepidation when people are going to be talking about you, saying “You did this,” or “You were the best at this,” and all that. And here’s Toby Keith and here’s Bobby Knight, Al Michaels, they’re all great. They’re all great. Pete was awesome. Tony was awesome. I texted them and called them and said, ‘Thank you!’ And they said, “We’re just telling the truth.” It’s amazing, it really is. BENCH: It all started one day, they called me and wanted to interview me about a player, and I told them a little bit. They asked what I was doing, and I told them about my life, and they said, “Well, your story is better than this other guy’s.” So that’s when the Sports Illustrated story came out, Mr. Mom, in June. MLB saw it, and they do documentaries on different people at different times, and I think that incentivized them to do one. BENCH: I think their mother’s going to take them for spring break, so I may run out there. I’ve talked to David (Bell). These players, they watch all the film. They know everything. They’ve got their own hitting coaches, their own mind. I usually go out there and sit down with the corporate sponsors, have dinner with them. But I like to go down to the minor leagues and watch the kids. I love to stand up on the podium and maybe point out when I see things about the pitchers or hitters. SN: I wanted to ask you about today’s crop of catchers. Are there any guys in particular you enjoy watching? Catchers who have caught your eye? BENCH: People want to know, ‘What happened to the great catchers?” They’re there. They’re there every day. Buster (Posey) didn’t have the greatest arm in the world, but he called one of the best games I can ever imagine. He handled the pitching staff. There’s different sides to that. Mike Zunino, who just got traded to Tampa, phenomenal. You can go down the list, really, of all these kids. But until you bat fourth in the lineup and drive in 100 runs … J.T. (Realmuto) got a lot of publicity because he started driving in runs and was productive. But until you get noticed offensively as well, people are just going to say, “He’s a great defensive catcher.” And they are, but until you put up the numbers, drive in the 100 runs, people are always going to question and say, they’re not like they used to be. But now, I think we’ve got a couple more catchers in. There are 15 catchers in the Hall of Fame. Baseball’s been around for 140 years, almost. That’s only one per decade. It’s not easy. And all of them had home runs and all of them had RBIs. SN: I wanted to ask you about the Hall. I’ve been lucky enough to have a Hall of Fame vote for three years now, and people ask me all the time what I think about Yadier Molina’s chances. You’re a Hall of Fame catcher, and you know how tough it is, so I’ll ask you: Do you think he’s had a career worthy of consideration for Cooperstown? BENCH: Oh, I do. I really do. The longevity, first of all. He’s a leader. A great catcher, a receiver, a thrower. He hasn’t ever hit for a lot of power, but he’s hit in clutch situations. The RBIs have built up. I was amazed when they gave him the new three-year contract, I’m thinking, ‘Why at this age?” I was broken down by that age. He’s such a good physical specimen and keeps himself in shape and he’s such a clutch hitter. The numbers are there. BENCH: And the back flip. We had (Dan) Quisenberry, we had Graig Nettles, we had Ted Williams, we had Pete, we had Mike Schmidt. It was up and down baseball. We had Davey Lopes. It was fabulous. It was interacting with the kids and everything else. The worst part of it all was we did not have a set time it was shown. One week it would be 5:30 in the morning and the next week it was 6:30. Coaches would get their little league teams together and watch this. Now, they could just DVR it. But, yeah, we miss it. Gosh, it’s been almost 35 or 40 years ago.